In many aspects of life there exists that which is pleasing to the eye, and that which is not. Often that which is deemed the most "beautiful" is held to a higher regard than that which is considered "ugly". Beauty is of course something which is dictated by the society in which we live in and no culture can claim to have more beauty than any other. In a previous post I wrote about what "style of karate" means to me, when it comes to form Vs. function. Now, I want to turn my attention to the dangers of practicing Karate only for pure aesthetics. Form over function has gotten us into trouble on a number of occasions and is still an issue for the human psyche. In a societal context the dangers are prevalent when we are marketed to with a set of beauty standards, the subsequent attempts to meet those standards, the many cultures trying to disregarding their own identity and the increasing number of industries that prey on those most vulnerable which can lead to body dysmorphic tendencies. These are all very serious issues that seem to never be fully removed from society, so long as we only ever focus on aesthetic beauty. You know, like praising a young child for “looking pretty”, and its association with being good. 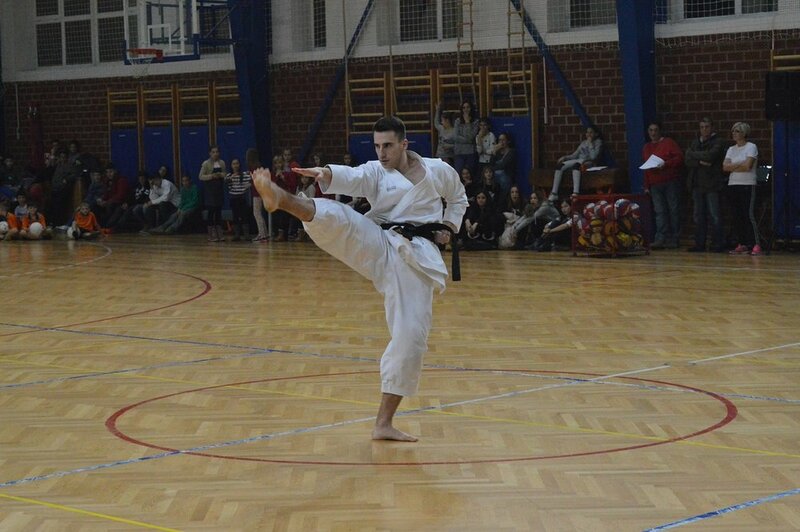 There are parts of Karate that also suffer due to a set of beauty standards within the practice; loss of application in Kata, a reluctance to learn a traditional over a sporting practice and the judging of others based upon what looks good as opposed to what works best. Many Karate practitioners fall into various traps of what is “right and wrong” as set by their Sensei and seniors as they try to emulate the style and form they are being taught. What’s wrong with that? You may ask. Depending on your view not a lot is wrong with that; however, there lies an issue which has plagued the Yoga world for some time that I notice becoming a part of the Karate world too. This is when the desire to fit to an aesthetic model creates harmful practices. At best it is simply when Kata changes to look better rather than allow for correct application, at worst it is when our bodies become damaged due to years of poor body alignment. In Yoga it occurs when practitioners see the slim gymnastic figures positioning themselves into complex poses, which then becomes something to be aspired to - and it is marketed this way. There is also the reinforcement made by the passing out of praise to individuals who push themselves to fit the prescribed mould. This leads to many who lack the years of experience pushing themselves beyond what they are capable, resulting in serious damage of their joints and muscles, which may have been avoided had they simply had a good teacher explain that they are their own unique person and should not be attempting to copy others. This egoic trend is creeping into Karate with looking good drowning out the substantial - even if it is "traditional authentic super realistic non-sporting Karate". Have you ever been told NOT to copy your seniors in Karate? Have you ever been told NOT to do exactly what Sensei says? Are we still surprised why people are still complaining of damaged knees, hips and elbows? Coupled with the “Budo spirit” we see Karateka putting their Karate training above their health; despite the whole point in training being to preserve health. I’m not saying not to push your limits, but do so with a view to keeping your body still able to train till your last breath; and believe me it is entirely possible to be the best there is without sacrificing your health. Be more critical of the flashy techniques and impressive physical feats; all that glamour and glitz is designed to impress, to draw you in, and perhaps, to inspire you. You do not necessarily have to emulate it. Breaking boards and baseball bats is one aspect. Where for years the Karateka has honed their body to withstand being able to break large pieces of wood, and yet it still comes at a cost of constant training, often with lifelong damage, just to provide a spectacle. A spectacle that can never match the reality of hitting a human body. Of course I am ignoring the aspect of building mental fortitude that is certainly required. Recently, I was asked about my time in Okinawa and if "all the grandmasters have calloused knuckles?" On the contrary, I explained, being able to hit effectively does not require knuckles of steel, let alone the hours of rock bashing needed to bring about rheumatism. Do the research - check online for all the latest evidence in sports science in how to get the most from your training along with the dangers of particular exercises. Just because it isn’t old and eastern doesn’t mean it isn’t useful - perhaps even question if what you are being taught as “the correct way” is in fact being taught incorrectly. It might even get you thinking twice about how you roll your knees during warm up.